Infographics are a powerful way to convey information and to make comparisons between multiple sets of data. Even more powerful is when those infographics move to show changes. Most motion graphics experts rely on complicated software like Adobe AfterEffects or Apple’s Motion to create effective animations. But you can create beautiful graphics and animations using Apple’s free presentation software, Keynote. 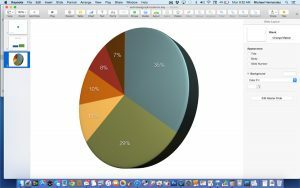 We already know that Keynote can make some great 2-D and 3-D pie charts, bar graphs and line charts, but it also does some great animations. The most basic way to do this is with an Interactive Chart, with bars, bubbles or scatter chart. Motion paths are created when using the Action animation. Bezier curves appear automatically and can be dragged to create a custom motion path. Animation can be created with the Magic Move transition between slides, and using the Build In and Build Out animations. But what’s really great is that customizable animations for objects can be created using the Action animation, which allows you to modify the motion path, ease in and out, and add other actions like bounce, flip and jiggle. Record your presentation to create a video file of your animation. 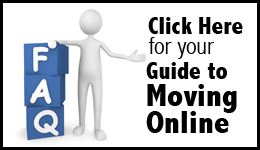 Drop that .mov file into Final Cut Pro or iMovie to edit or create a web-optimized version. 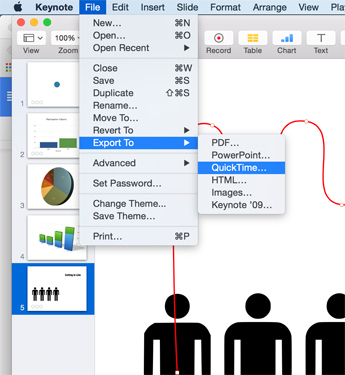 Once your animations are created, simply record your presentation, and then save as a Quicktime (.mov) video. While Keynote is no replacement for the power and granularity of pro apps like AfterEffects and Motion, it allows students an easy way to make nice looking animations with minimal training. 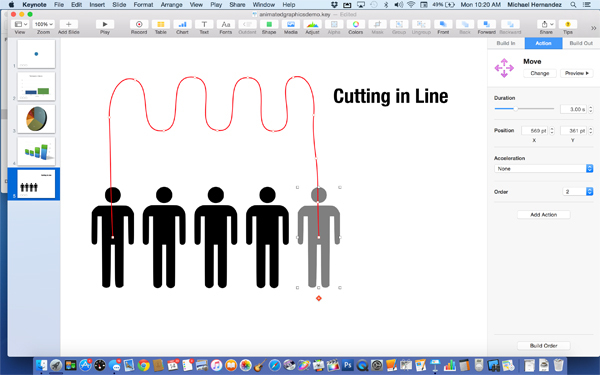 While it’s not journalism-related, check out this blog post by Linda Dong, which is a great example of what you can do with animation in Keynote. The article contains the original Keynote document that you can download to see how she created the animations.